Night time in the desert isn’t what most people would think it’s like. It can be scorching hot during the day, and absolutely freezing at night. Geoffrey pulled the thick woolen blanket around his shoulders. But that wasn’t what was irritating him. Dale Collier snored like some large dying beast. Full of volume and stuttering resonance, like Geoffrey had never heard before. He looked over at Nathan. They had stopped just below the crest of a hill. Just after sundown it was best to give the eyes time to fully adjust to the darkness for maximum night time vision. Because unless they absolutely had too, they always kept their headlights off at night. On a clear night like tonight, there was plenty of light. Which is also why it was so cold tonight. Radiational Cooling they called it. Geoffrey understood the science behind it, but the practical application of it after cooking under the sun was a different reality than what he had read about in school. Geoffrey looked up into the sky. The sky was completely filled with stars. It was a spectacular view. He stood up and stretched and adjusted his blanket again. Looking back he could see Dale’s hair poking out from under the edge of a couple blanket on one side, and the soles of his boots on the other, and crossed in between was his Thompson. Dale didn’t like a gun if it didn’t spew bullets like a hose. Geoffrey jumped down out of the truck to help Allen, who was in the process of pulling out fuel cans and lining them up. Allen didn’t bother with wearing a blanket like a cape for extra warmth. He had cut one down and wore it under his jacket for an extra layer, and then used scarves around his neck. A damn fine idea Allen had. They took turns holding the funnel and pouring fuel from the heavy cans. 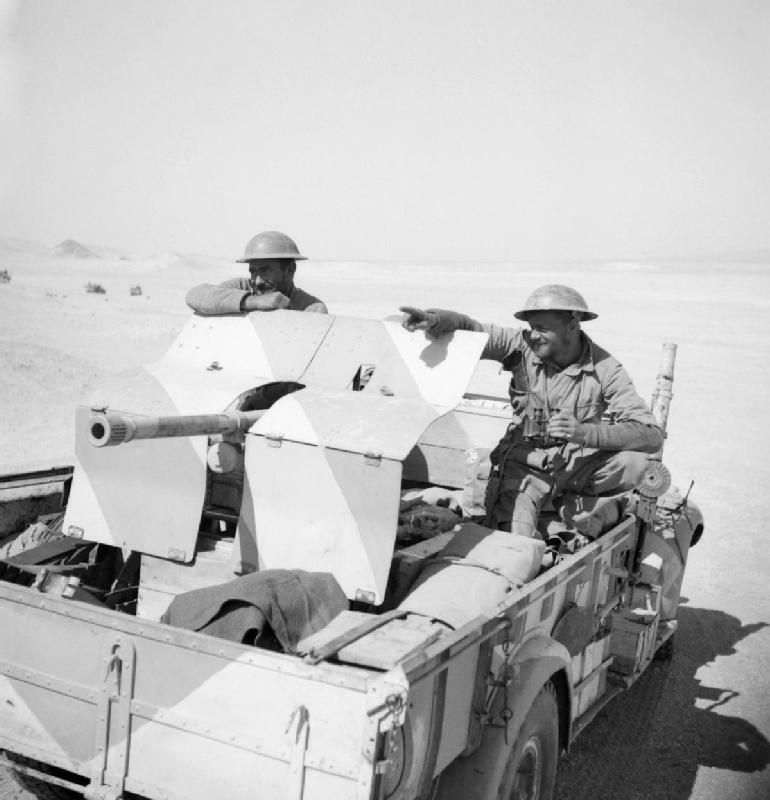 They had supplied fuel cans, and then they had German “Jerry Cans” that were much better and easier to use. They always kept the German cans and tossed the others. Once they had topped off the truck’s fuel and stowed the jerry cans away for future use, Geoffrey looked to the other trucks. Truck two was parked about twenty yards away with Lt Basskett sitting on top of the bed’s frame. He had a set of binoculars and was watching the horizon. Friedman was wrapped like a cocoon in a blanket, but watching everything. Their gunner was also asleep. “Captain.” Friedman nodded. “We gassed up as soon as we stopped.” Basskett said. “Excellent. We’ll be moving again soon.” With that, he jumped out of Truck Two and headed over to Anvil. Lieutenant Philip Clayton saw him coming and hailed him in a raised whisper. “Too close to the Jerries for comfort and too far away to shoot them. We should close the distance.” Clayton was standing in the bed of the truck leaning on the armored plate of Anvil’s cannon. He was wearing his khaki kilt, boots, and nothing else but his hat. Over one shoulder was a Mauser 98 Karabiner. Tucked into his belt behind his ragged sporran was the hilt of a large knife. Philip Clayton was possibly mad. “That’s what people keep telling me, Sir.” Clayton’s eyes were wide and fierce as he looked at Geoffrey, who found it unsettling. Clayton pulled the pin and let the spoon fly. “Watch your head.” He said with a demented tinge. He stood up and shouted “GET YOUR FILTHY HANDS OFF MY DESERT!” And then he threw a grenade at the German. It was a great throw. Geoffrey could have sworn he heard it whistling as it flew. The German soldier peaked his head over the wall, “What was that?” The grenade hit the German square in the face with a wet crunch of breaking nasal cartilage and teeth, and then it exploded. There was a shower of red stained debris. He handed Geoffrey a German stick grenade, then slung the rifle over his shoulder and walked away. The rifle was his ever since. Some time later, “Filthy Desert” was scratched into the right side of the buttstock. The gun was always cleaned and oiled, and close by. Some time after that incident, Geoffrey had found out that before the war, Philip had been an undergraduate student at a law school. It seemed that warfare suited Philip Clayton better than a lecture hall. “Yes, Sir. She was especially thirsty,” Philip said. Geoffrey nodded, “It’s all the extra supplies. Don’t worry though. We’ll be glad we have it soon enough.” They had loaded up twice the amount of drinking water, fuel, and rations with the anticipation that they will need it to take care of the aircrew once they found them. I’m loving this series, George. Keep ’em coming! Planning a book on this? Thanks. Yes. This will be a book. It’s going to involve 3 groups of people and you are being introduced to one of them so far. You’ve met the British Group. Next you will meet the German Group. And then the American Group. Hell of a good start!